Denton House is a wonderful family run B&B guest house in the picturesque village of Hesket Newmarket, close to Caldbeck, in the Northern Fells of the Lake District National Park. 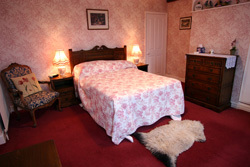 The bed and breakfast has been managed by Susan and Alan Armstrong for over 10 years and has a reputation for spacious comfortable guest rooms and superb breakfasts, using only the finest local produce. We're located just a couple of doors down from the famous Old Crown pub, the first cooperatively owned pub in the UK. After a hard days walking on the Caldbeck Fells, what better way to finish the day than with a swift pint or three of well kept real ale, produced by the Hesket Newmarket Brewery followed by a tasty home cooked bar meal, knowing that you've got a good night's sleep in store at Denton House! The views from the back of the house are across open fields and rolling countryside with views up to the Caldbeck Fells. From the front, views are across the village towards Newlands. The sounds of cattle and sheep in the fields, as well as numerous birds in the garden make Denton House a very relaxing place for a stay away from it all. Yet we are only a short drive from historic Carlisle, Keswick and Ullswater, Hadrian's Wall and the market town of Penrith and are very close to the Cumbrian Way walk. Whether you a looking for a holiday or a short break away from it all, Denton House guest house offers home from home comfort in a peaceful, relaxing environment. A warm Cumbrian welcome awaits you!